El siguiente listado de libros pretende ser un recopilatorio de libros enfocados al Análisis de Malware (Definiciones, Investigaciones, soluciones, tendencias, etc). La mayoría de estos libros son los que vengo utilizando para desarrollar dichos Laboratorios. Batten down the hatches! Hackers, spammers and thieves (oh my!) are after you! The mere act of turning on an Internet-connected computer can put you, your family, and your personal finances at risk by exposing you to viruses, scam artists, hackers, identity thieves, and spammers. How do you fight back? Absolute Beginner’s Guide to Security, Spam, Spyware and Viruses is your first line of defense. Symantec’s chief antivirus researcher has written the definitive guide to contemporary virus threats, defense techniques, and analysis tools. Unlike most books on computer viruses, “The Art of Computer Virus Research and Defense” is a reference written strictly for white hats: IT and security professionals responsible for protecting their organizations against malware. Peter Szor systematically covers everything you need to know, including virus behavior and classification, protection strategies, antivirus and worm-blocking techniques, and much more. Our Internet-connected society increasingly relies on computers. As a result, attacks on computers from malicious software have never been a bigger concern. Computer Viruses and Malware draws together hundreds of sources to provide an unprecedented view of malicious software and its countermeasures. This book discusses both the technical and human factors involved in computer viruses, worms, and anti-virus software. It also looks at the application of malicious software to computer crime and information warfare. Computer Viruses and Malware is designed for a professional audience composed of researchers and practitioners in industry. This book is also suitable as a secondary text for advanced-level students in computer science. A rootkit is a type of malicious software that gives the hacker “root” or administrator access to your network. They are activated before your system’s operating system has completely booted up, making them extremely difficult to detect. Rootkits allow hackers to install hidden files, processes, and hidden user accounts. Hackers can use them to open back doors in order to intercept data from terminals, connections, and keyboards. A rootkit hacker can gain access to your systems and stay there for years, completely undetected. Learn from respected security experts and Microsoft Security MVPs how to recognize rootkits, get rid of them, and manage damage control. This book deals with computer viruses envisaged from three different points of view, namely the theoretical fundamentals of computer virology, algorithmic and practical aspects of viruses and their potential applications to various areas. The theoretical formalization by means of Turing machines, self-reproducing automata and recursive functions enable a precise and exhaustive description of the different types of malware. It follows that the main stakes of computer defense and antiviral fighting are easily highlighted. Detailed analysis of the source code for representative members of each virus/worm family allows the reader to grasp the basic algorithmic aspects involved in self-reproducing codes. The C programming language has been systematically used for a better understanding of the considered codes. All of the big viruses of recent times (think “Melissa” and the “Love Bug”) have used e-mail protocols to propagate themselves–often taking advantage of the address-book features of e-mail clients to identify their victims. The E-mail Virus Protection Handbook explores how you, as an administrator of an e-mail server (and perhaps some of the network resources that surround it), can protect your users from productivity loss that results from e-mail virus infection. This book is best suited to administrators of smallish networks who have responsibility for (and direct control over) firewalls and network-wide antivirus strategies, as well as e-mail readers on the client side. Hardly a week goes by without news of some malicious program or other playing hob with large numbers of computers somewhere on the Internet. Viruses Revealed shows where computer viruses come from, how they spread, and how you can protect the computers you’re responsible for. It recognizes that viruses are inherent in the modern computing environment (which makes it easy to share data among machines) and that there’s no absolutely certain way to maintain any degree of usefulness in a computer while eliminating all risk of viral infection. From there, the three authors proceed to make their readers informed participants in a dangerous computing world. They do this by defining terms (like dropper, a program that isn’t a virus itself but which serves to install one), explaining concepts (like the difficulties antivirus programs face in detecting Trojan programs), and documenting historical events (infamous viruses of the past–Love Bug, Kournikova, and so on–and why they worked). Whether you want to learn how to develop a robust, full-featured rootkit or you’re looking for effective ways to prevent one from being installed on your network, this hands-on resource provides you with the tools you’ll need. 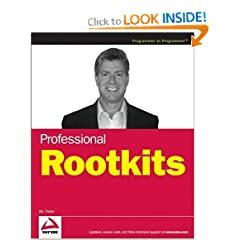 Expert developer Ric Vieler walks you through all of the capabilities of rootkits, the technology they use, steps for developing and testing them, and the detection methods to impede their distribution. Swat spam, vanquish viruses, knock down pop-ups, and expose spyware with help from this one-of-a-kind resource. Loaded with insightful advice, practical tips, and trial software, this book-and-CD defense will help you rid your computer of the perils and nuisances of Web surfing once and for all. Author and tech expert Ken Feinstein gives easy-to-understand explanations of the technologies at work, and just exactly what steps you can take to take back your e-mail, your surfing enjoyment, your privacy, and your computer. Dissecting the dark side of the Internet — with its infectious worms, botnets, rootkits, and Trojan horse programs (known as malware)– this in-depth, how-to guide details the complete process of responding to a malicious code incident, from isolating malware and testing it in a forensic lab environment, to pulling apart suspect code and investigating its origin and authors. Written by information security experts with real-world investigative experience, Malware Forensics: Investigating and Analyzing Malicious Code is the most instructional book available on the subject, providing practical step-by-step technical and legal guidance to readers by featuring tools, diagrams, examples, exercises and checklists.